Every emotion has a word. Maybe sometimes language does not fail us. We just need to look beyond our comprehension and beyond the way we perceive the world to be. There are so many times when I see people making fun of languages all around me and specifically that of Indian languages and of course by Indians themselves. Maybe this book is for all of them who cannot understand the beauty of any language and words and meaning in them. In life, there are times when maybe you just need the perfect word for the way you feel or for the way things are. Language then doesn’t matter. “Lost in Translation” is the perfect cure for those times. 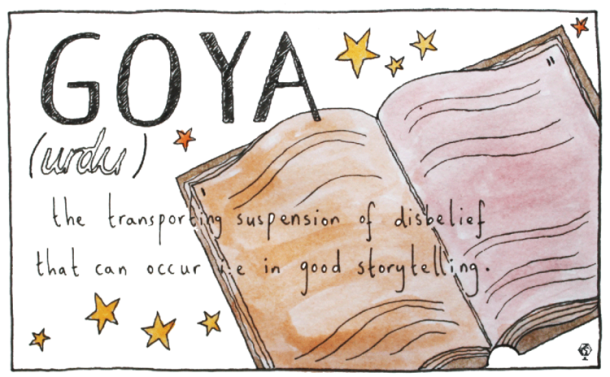 It is a beautifully illustrated compendium of untranslatable words in the world and of course it does not cover all the words, but whatever it does, it just manages to melt the heart and leave that smile on your face for the longest time. 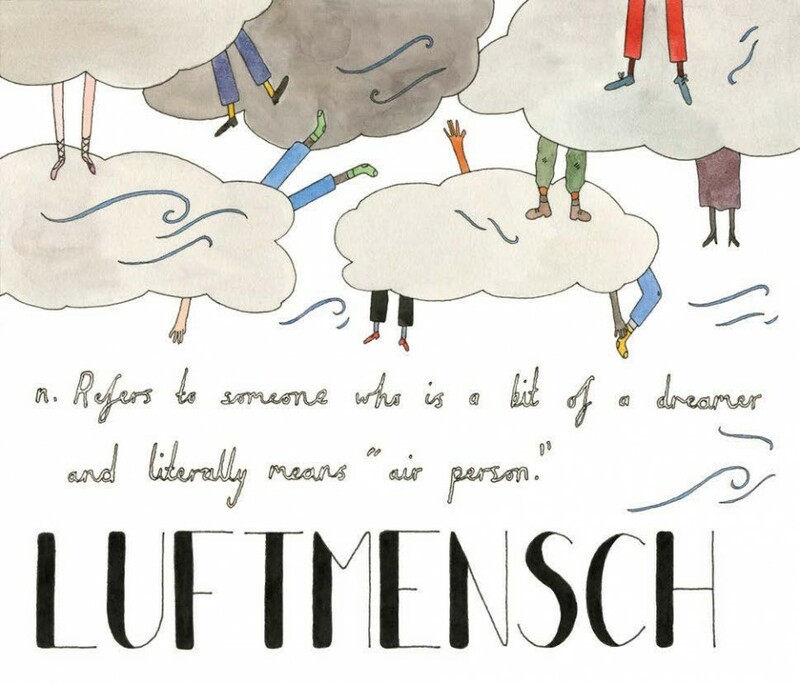 It has words such as “Luftmensch” which refers to someone who is a bit of a dreamer and literally means “air person”. It also contains “Jugaad” with quite a cute illustration to go with. The illustrations in the book are also something else – they are flighty and frivolous and encompass all life and beauty. “Lost in Translation” is a book that will make you see beyond your world and embrace the newness of other words on your tongue. I pronounced each and every word and after a while, I felt like I could feel the emotion. This is one book you will not regret owning and will cherish for a very long time to come. 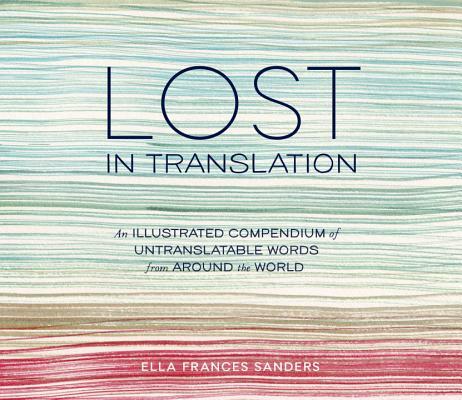 This entry was posted in Books, Language, Review, Ten Speed Press, Words and tagged Ella Frances Sanders, emotions, Illustrated, Language, Lexicon, Lost in Translation, Ten Speed Press, Untranslatable Words on December 4, 2014 by thehungryreader. I have always believed in reading big books. The bigger, the better I say and have always maintained that. Having said that, I am also partial to novellas and short novels as and when they come my way and off late they have been coming my way more so than I expected. Reflections in a Golden Eye is one such short gem that most people do not know about. Carson McCullers has always been and will in all probability always be famous for The Heart is a Lonely Hunter and The Ballad of the Sad Café, of course as they were brilliant books and pieces of magnificient literature, but this is no less. I picked this one up on a lark and I am glad that I did. Carson McCullers had a knack of portraying the loneliness her characters felt. When I read her books, I am almost overwhelmed with sadness myself. The plot almost becomes secondary. It is the way she writes and describes the surroundings that almost make you skip a heartbeat and wonder how did she manage to churn out such brilliance. I for one am not surprised, considering she knew that she always wanted to be a writer and admitted it to one-time friend Truman Capote. And now to the book. Reflections in a Golden Eye is set in the American Deep South, in a fort, during peace-time in an army camp. The story centers around six people, each battling with their own demons, each wanting love in it’s varied fractured forms, and each looking for salvation and finding none whatsoever. It concerns the relationships between five key figures – repressed and confused Captain Penderton, his unsatisfied flighty wife Leonora, who is having an affair with Major Langdon, whose wife Alison is suffering great mental and physical exhaustion. Outside of them is Private Williams, somewhat simple and quiet, but menacing. As with all of McCullers’ work it deals with the nuances of spiritual isolation, the ways in which we find ourselves completely alienated despite and because of our surroundings. The novella is brutal in the refusal to soften these stark elements of the human psyche. Shockingly violent, in both actions and private thoughts. These lives are burdened with intense hatred for each other that it controls their entire spiritual beings disallowing them to fully comprehend themselves. It is typical McCullers’ in that it is unspeakably bleak, and delves into the darkest emotions. 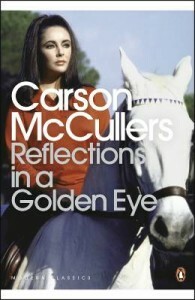 Knowing of McCullers’ personal life, and her dedicating Reflections in a Golden Eye to Annemarie Schwarzenbach – who she was immensely attracted to, but who constantly rejected her advances – speaks volumes about where she is coming from, and relates to the concept which she would come to struggle with in her later work The Ballad of the Sad Café, the eternal disparity between the lover and the beloved. Reflections in a Golden Eye is a masterpiece according to me. A book that you should not miss reading. Once you are done reading the book, try watching the film starring Elizabeth Taylor and Marlon Brando. It will for sure knock the socks out of you. This entry was posted in Books, Fiction, Literary Fiction, Novella, Penguin Books, Review and tagged Carson McCullers, emotions, Loneliness, novella, penguin modern classics, Reflections in a Golden Eye, The Ballad of the Sad Cafe, The Heart is a Lonely Hunter on May 21, 2011 by thehungryreader. I have always wondered while reading a novel, as to what goes on behind the scenes – the writer’s mind and his thoughts that provide the shape and form to the novel. How does he/she manage to produce such brilliant works time and time again, without any break or reluctance? How is the novel crafted? Is it art imitating life or vice-versa? And my answers were partially (I think) answered by Pamuk’s new non-fiction collection of Charles Eliot Norton Lectures, titled, “The Naive and the Sentimental Novelist”. The title draws from the famous essay by Friedrich Schiller, “Uber naive and sentimentalische Dichtung”, conventionally translated as “On Naïve and Sentimental Poetry” – even though the principal connotation of “sentimentalisch” in German is different than “sentimental” in English. Schiller posited two types of poets and, following his example, Pamuk refers to two models of novelist and reader. What the book really consists of are Pamuk’s meditations on the art of the novel, comprising “all the most important things I know and have learned about the novel.” Pamuk sets as his main goal “to explore the effects that novels have on their readers, how novelists work, and how novels are written.” Pamuk certainly is well qualified to speak on that subject (in addition to having won the Nobel, he teaches comparative literature and writing at Columbia). Further, his perspective is rather unusual, being a self-taught novelist from a Turkish culture with a fairly weak tradition of writing and reading books. There is no coherent theory of the novel in the book. What it does have is the authors’ perspective on writing and reading and that is what makes the book so different and unique. It does not come with a reading list either. The chapter that stayed with me after I had finished reading the book was about The Center of the Novel and how as readers we read novels to search for that center. How as readers we feel that the novel is here to present us with “that something larger meaning” which may be the other art forms don’t live up to and I agree to a large extent with that. No one can take that away from readers or the novelist. To sum up the book, I loved reading it. Pamuk presents his case engagingly and tautly, in a pleasant mix of autobiographical titbits, reading and writing experiences, and theory. It does not convince as presenting a ‘theory of the novel’, nor does it claim or attempt to. What it does instead is make the reader see things differently and apply them while reading a novel. It talks about how a reader and writer’s thoughts can and may be one day wil merge and the true center will then emerge. Last Thought: I could not wait to read a novel after I was done with this book. Thank you, Mr. Pamuk. This entry was posted in Authors, Authors I Love, Books, Hamish Hamilton, Non Fiction, orhan pamuk, penguin india, Review and tagged art of the novel, charles eliot norton, emotions, essays, flaubert, hamish hamilton, harvard, henry james, nonfiction, orhan pamuk, penguin books, penguin india, plot, reading, sentences, the naive and the sentimental novelist, tolstoy, words, writing on February 28, 2011 by thehungryreader. Jodi Picoult’s novel Second Glance impressed me enormously. Vanishing Acts can also boast fascinating characters, stylish writing and a cleverly constructed plot, this time using the forms of courtroom drama, prison novel, and love triangle. Or maybe triangle isn’t quite the right word – except that any polygon, however complex, can be broken down into triangles. Vanishing Acts is yet another well told tale by Jodi Picoult, who is a master at character development. Once again telling the story through first person accounts of the main characters, she weaves together a family drama centered on a “kidnapping” that had occurred 28 years earlier. Delia Hopkins is an expert at finding missing persons, with the help of a Search and Rescue bloodhound named Greta. She never suspects that she is also a missing person herself, until police come to her house to arrest her father for having kidnapped her twenty-eight years earlier. She learns that his real name is Charles Matthews, not Andrew Hopkins – and that the mother she thought long dead is still alive. Delia calls her two best friends for help – Eric, her fiancé and the father of her four-year-old daughter Sophie, and their oldest friend, Fitz. Eric agrees, despite his better judgment, to defend Delia’s father; Fitz, a reporter, is sent to Arizona to cover Andrew’s trial as part of a series of `Strange but True’ stories. Eric inadvertently alienates the judge, who sets Andrew’s bail at two million dollars. While Andrew learns how to survive in the violent world of an Arizona jail, Delia, Eric and Fitz go looking for Delia’s mother, Elise, and Delia’s forgotten past. Delia discovers that she and Eric have yet one more thing in common – both of their mothers were hopeless alcoholics, too often too drunk to properly care for their children. And like her, her mother had two men in her life. Because Eric has also been an alcoholic since his teens, and is now too scared even to drink coffee because of the buzz, Delia becomes even more convinced that her father made the right choice by taking her away from her home. Acting within the law might have been disastrous: in the 1970s, Eric reminds the court, custody was almost always awarded to the mother, no matter how poor a parent she might be. The prosecution, however, casts doubt on Andrew’s version of events, and soon the whole case hinges on unreliable and unverifiable memories. Vanishing Acts is a superbly suspenseful courtroom drama with plenty of twists, as well as an unusual love story. But most importantly, it’s a well-written story that transcends the restrictions of genres and marketing categories because of Picoult’s remarkable gift for creating wonderfully well-rounded and multi-layered characters. The plot tends to get complex, because it is. The characters speak to you like they are supposed to. The book remains in your thoughts longer than you think it would. All in all, it is one of those books that you cannot seem to forget easy. Picoult uses several different voices which lead the reader to, in pieces, discover the history of the family tragedy. Once again, Picoult makes us think about complex issues and even our own history while weaving a story that is so captivating you can’t put the book down. This entry was posted in Authors, Books, Fiction, Review and tagged Court room drama, disappearance, emotions, family, hachette books, Hachette Group, jodi picoult, mystery, Vanishing Acts on December 1, 2010 by thehungryreader.